Sema performances will be performed for guests as part of the celebrations for the 791st anniversary of Rumi's arrival in Konya. Mevlana Jalaluddin Rumi, also known as Jalal ad-Din ar-Rumi, the great philosopher who believed in the importance of being patient and that moral and knowledge must be valued above all kind of earthly positions, honored central Turkey's Konya 791 years ago. Konya is now getting ready to celebrate the anniversary of Rumi's arrival in the city. Supported by the metropolitan municipality, Konya, the last stop on Rumi's holy voyage made with love eight centuries ago, is ready to celebrate the 791st anniversary of his arrival in the city on May 3-5, starting with a special train service, "Rumi," that sets off from Istanbul to Konya for the first time. Entitled "Teşrif-i Konya" ("Honoring Konya"), the celebrations will feature a ney performance and Masnavi (an extensive poem written by Mevlana) with many figures from media, sports, science and culture circles. The program will also include a march, gülbank prayer (prayer made by Janissary band members), Sema performances, a play "Vuslat" (Reunion), a concert by Palestinian band Le Trio Joubran, which consists of Palestinian brothers Samir, Wissan and Adnan, the fourth generation members of a world-renowned lute player family, and Sufi film days. Konya Governor Cüneyit Orhan Toprak and metropolitan municipality mayor, Uğur İbrahim Altay will welcome Esin Çelebi, a grandchild of Rumi from the 22nd generation, and her family after their walk from Karaman to Konya. It will be followed by the Love and Amity Walk between the tomb of Shams Tabrizi and Rumi in addition to the "Gülbank" prayer beside the sarcophagus of Rumi. Activities such as marbling, ceramic and painting exhibitions will also be held for the first time this year. Altay said Konya became the address for knowledge, love and tolerance with the arrival of Mevlana and his family. "Eight centuries ago, our city, Konya embraced Mevlana Jalaluddin Rumi and his family at the end of a long journey from Balkh. Mevlana [his holiness] said the human being is in a constant state of traveling and this long, hard journey greatly contributed to his philosophical development. Konya, a center for knowledge, philosophy and arts in Islamic lands, stretching from Khorasan to Andalusia at the time of the Seljuks, embraced many dervishes and gained great importance with the arrival of Mevlana. This year, for the first time, we will celebrate the anniversary of Mevlana's arrival in the city by honoring it with a special train service called Rumi. 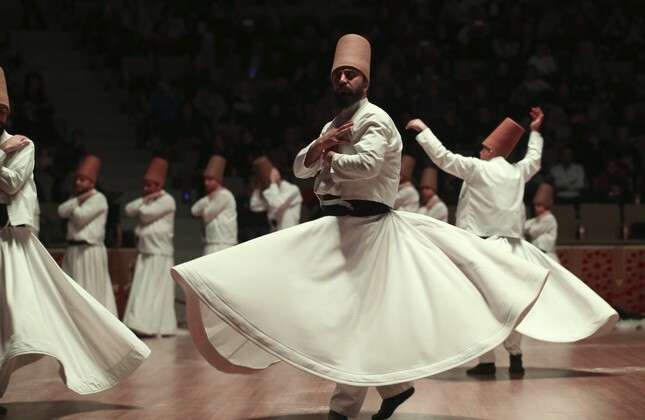 This honoring of Mevlana, who brought love, peace and amity to Anatolia will be celebrated with a range of events in the aftermath of the special train service."